This is a three and 1/2 hours (which might extend a bit) nightscape post-processing workshop with Rogelio Bernal, that's me. If you've never heard of me, check my work here in DeepSkyColors.com, or in my Flickr account, or my list of awards and accolades. This will not be a hands-on workshop where teacher and students process simultaneously the same images. Instead, I will be processing images LIVE, demonstrating techniques, tricks and processes applicable to a number of situations. Students are welcome to bring their laptops, but again, I will focus on demonstrating the techniques live and making sure the students understand them, not in following the work of the students. We use PayPal to collect workshop fees. If you do not have PayPal but wish to attend, please contact us. I like to divide image processing into two categories: the concepts and processes everyone needs to know, and the techniques that will help you give the image that particular interpretation you're looking for. The first category is about concepts and tools. The second goes from simple tricks and techniques to absolute control. Most of the processing will be done in Photoshop, plus a few surprises. The basics will be covered, from histogram or curves adjustments, contrast enhancement techniques or noise control to color balancing or basic masking techniques. Then there's the more advanced and also creative side of the workshop. This is where you're going to learn things you won't learn anywhere else, as I introduce some techniques I've learned or developed while working with deep-sky images (galaxies, nebula, etc) that, when applied to night photography, they work remarkably well (not many people know this ;-) .... Some of the techniques I will be showing go from clean sharpening techniques that don't leave ringing artifacts around edges (Gibbs effect), to clever techniques to deal with noise, star detection and manipulation (and why this is important), advanced masking techniques, some image restoration techniques (no, not the clone stamp! well, that too) or what I call "process to mask" (it will all become clear once I explain it) which is a technique that works great for detail enhancement, HDR composition, noise reduction, mosaics and many other things. 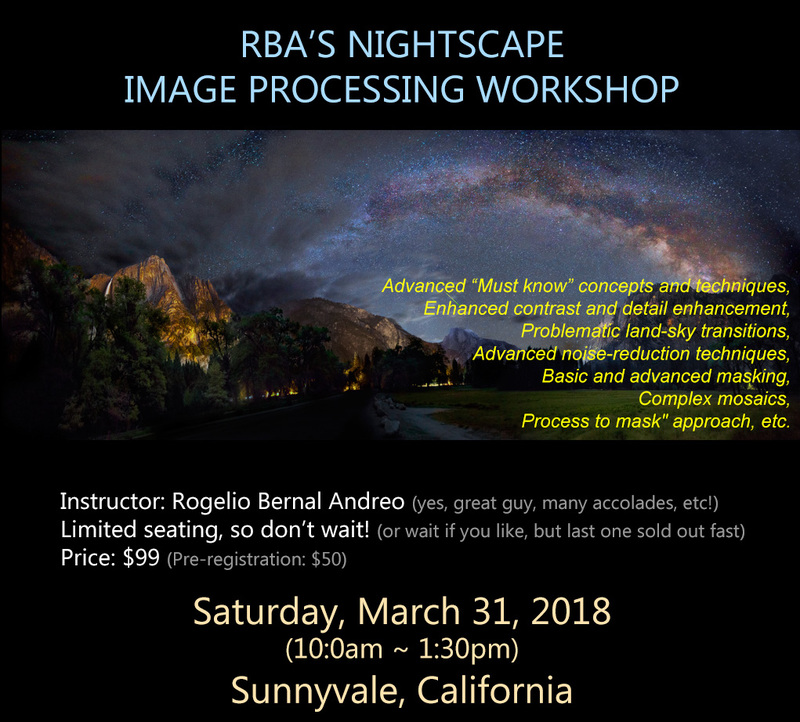 Unlike other fine processing workshops given by other seasoned nightscape photographers, here you'll be learning from a seasoned deep-sky photographer, in addition to night landscape photographer. Not many people are aware of this, but as I mentioned earlier, knowing some deep-sky image processing techniques is going to help you on your nightscape processing efforts, trust me. Every person I've introduced to these techniques has come back to me telling me they've been able to produce images very much to their liking, yet quite different - as in better - than what they were able to do before. On top of that, my forte is, in fact, image processing, even more than photography itself. 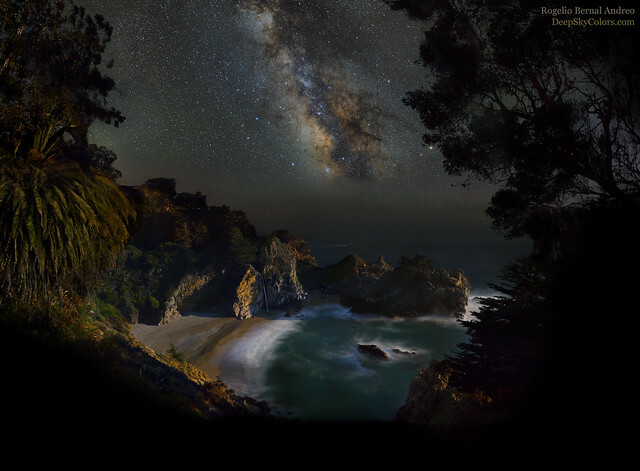 Every article I've written, every talk I've given at conferences around the world, every educational book I've been a part of... it's always been about image processing, whether deep-sky or nightscapes. Last, while I will be very detail oriented as I show you these techniques, please notice that I encourage people to NOT follow cooking recipes when processing their images, and instead, manage their way to meet the goals they set, or at least get as close to those goals as humanly possible. You will learn the tools and at the same time, learn that these are indeed just tools - the moment of truth is when you know where you want to go and use the right tools to get you there, as opposed to using the tools "because it says so in here" and hope things end up looking ok, and this too will be taught during the workshop. I will show everything live, no PowerPoint slides, videos or anything like that, but you do NOT need to bring a laptop. You will want to have something to take notes, so you can sill bring a laptop, or any other device you may want to use to take notes. An good old-fashioned notebook and a pencil also work just as well. There will be coffee and soft drinks, as well as some snacks, bu you're welcome to bring your own (snacks and non-alcoholic drinks). 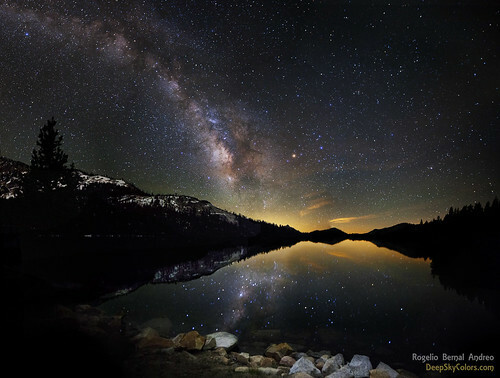 Frequently described by peers as one of the most recognized and influential deep-sky and night photographers in the world today, I've been all around the globe doing astrophotography in many of its forms, predominantly deep-sky and nightscape photography. I'm told to also have inspired many other astrophotographers with my personal "deep and wide" style and techniques. I have given talks and workshops about astrophotography and image processing in USA and Latin America, Australia, Europe and Asia... For a list of awards and accolades please click here.